If these are house wines, then I want to live in that house. As See by Chloe, Miu Miu (Prada) or Marc by Marc Jacobs are secondary lines from high end fashion designers at lower prices, Harvey Nichols Own Label works on the same principle. For those of you who have ever lined up at H & M for the latest diffusion line from a big designer then you will GET these wines. 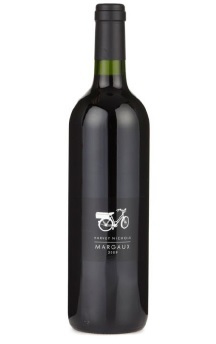 Kate Moss for Top Shop is about as close as it is going to get to the supermodel’s wardrobe; just as Margaux 2009 is a taste of drinking Rauzan-Segla 2009 everyday. The Rauzan-Segla 2009 Grand Vin is around £85 per bottle, not including all the storage and faff to buy Bordeaux at this level, the Margaux 2009 is part of the vintage for £25. A bit more easy-going than the Grand Vin, this is a very successful collaboration between the 2nd cru classe and Harvey Nicks. The “controversial” drawing by Karl Lagerfeld on the 2009 label in the Grand Vin is replaced by a simple picture of a (French? chic?) bicycle. This is quite of an in-joke in itself for this major fashion store. Some of my friends thought the label was a bit too understated considering how good the wines are. 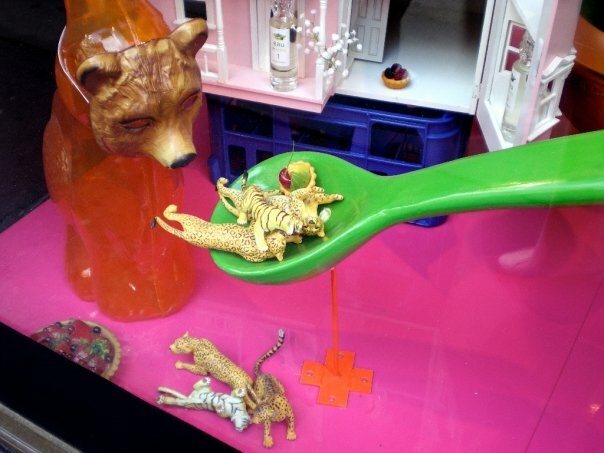 There’s something wry about the design, much like the style of Harvey Nicks, which can be summed up by the photo I took in 2009 of the window display: cool quality with a quirky sense of humour. This is a cut above supermarket own labels and you can taste the difference. There are six wines in their range: Margaux 2009 (Rauzan-Segla), Riesling 2012 (Kilikanoon Mort’s Block Clare Valley), Sauternes 2010 (Chateau Coutet, 1st cru classe), Beaujolais-Villages 2012 (Philippe Vermorel at Domaine de Rochemure), a Prosecco (Sorelle Bronca) and a 10YO Tawny Port (Quinta de la Rosa). The Beaujolais 2012 is what you want from a Beaujolais but very rarely seem to get at the villages level. None of that nasty shock finish business. Soft and juicy and easy-going. The Riesling is pure apero drinking in summer and with its intense lime characters is cooler than a Caprihna. This is the “diffusion label” wine for the excellent Kilikanoon winery in Watervale, Clare Valley. The Prosecco has the just right amount of weight and sweetness, and again, it has a lovely clean finish. I don’t want always want my Prosecco to be too serious. But I do want it to do a job. And more often than not, that job is have fun, please. With their minimal Harvey Nichols packaging, they won’t shout at you from the shelves. They are definitely worth a trip up to the top floor in Knightsbridge to grab a few bottles after a glass of Champagne at the Harvey Nicks bar. Thanks to Harvey Nichols for introducing me to their Own Label wines.